The SparkyLinux website describes SparkyLinux as a lightweight, fast and simple distribution designed for old and new computers. 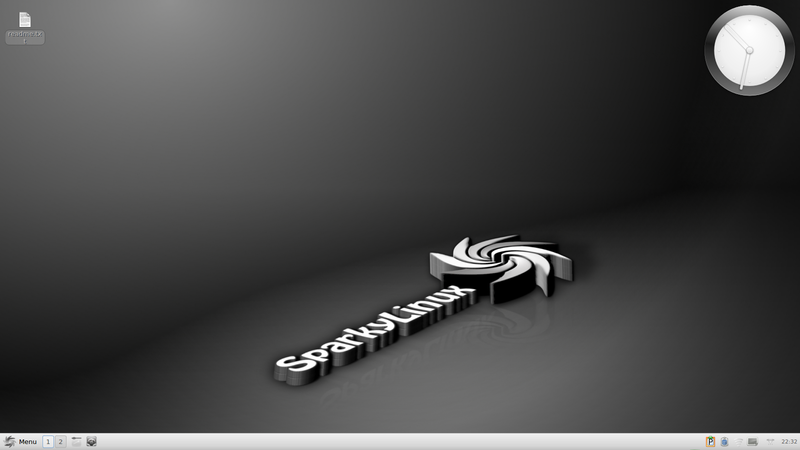 Based on the Debian Testing branch, SparkyLinux has various different versions available including LXDE, OpenBox/JWM, e17, MATE, Razor-QT, Cli and the GameOver edition. SparkyLinux is a rolling release so once it is installed you don’t have to download another version in 6 months time as the software is updated automatically as part of the update mechanism. SparkyLinux isn’t as easy to install as say a Ubuntu or a Linux Mint but neither is it particularly taxing on the brain. For instance when Ubuntu or a derivative asks for your language you pick it from a list. SparkyLinux gives a huge list of languages in various different formats. Keyboard layouts are the same. One thing I did like was the fact that SparkyLinux forced you to enter a different password for the root user and the standard user. To download SparkyLinux visit http://sparkylinux.org/download/. If you have a poor internet connection then you can always buy a DVD or USB drive with SparkyLinux pre-installed. The way I would describe Razor-Qt is fast and functional. It isn’t the most attractive desktop I have ever seen but it gets the job done. SparkyLinux has a dark background with a clock in the top right corner and the customary panel at the bottom that many an operating system adorns nowadays. The panel contains a menu, 2 icons to represent virtual desktops, a browser icon, a clipboard icon, networking icon, an audio icon and a clock. The menu is a traditional style menu and if you used Windows back in the day (i.e. around Windows 2000) then you will feel right at home. The items on the menu is a little bit eclectic. There are the usual categories that I would expect to see such as Accessories, Games, Graphics, Internet, Office, Sound & Video etc. 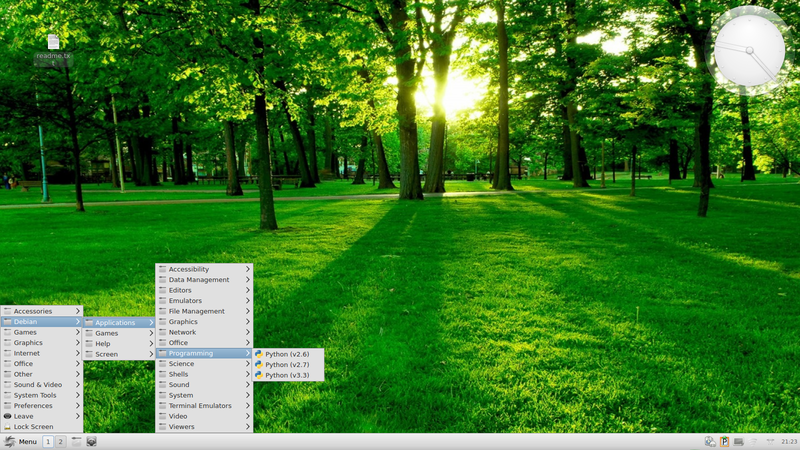 The oddball item is the “Debian” submenu which branches out into a similar list of categories. In those categories are the same applications that appear in the main set of categories. You may have noticed that I changed the desktop wallpaper in the previous section. To do that simply click on the desktop and choose the option to change the desktop wallpaper. 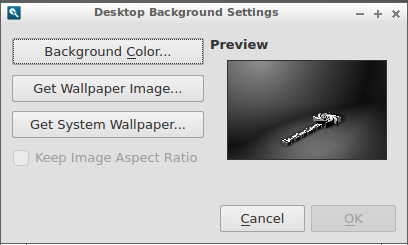 There are three options available.Clicking the “Background Color” option lets you pick a block of colour for the desktop. “Get Wallpaper Image” lets you navigate the file system to find a suitable image to use as the desktop wallpaper. “Get System Wallpaper” lets you pick from the wallpapers that come with the system (2 of them). You can of course configure the panel at the bottom of the screen. 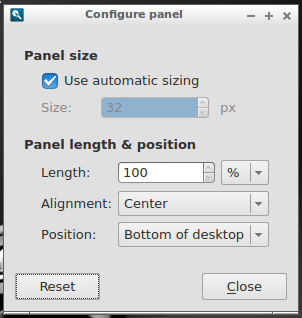 Perhaps there aren’t as many options available as the LXDE and XFCE desktops but you can choose the size, alignment and position of the panel on the desktop. Further icons can be added to the panel by right clicking on the panel and selecting the option to add plugins. You can also add plugins to the desktop itself by clicking on the desktop and choose add desktop plugins. Connecting to the internet is as simple as clicking on the icon on the panel and selecting the required network. 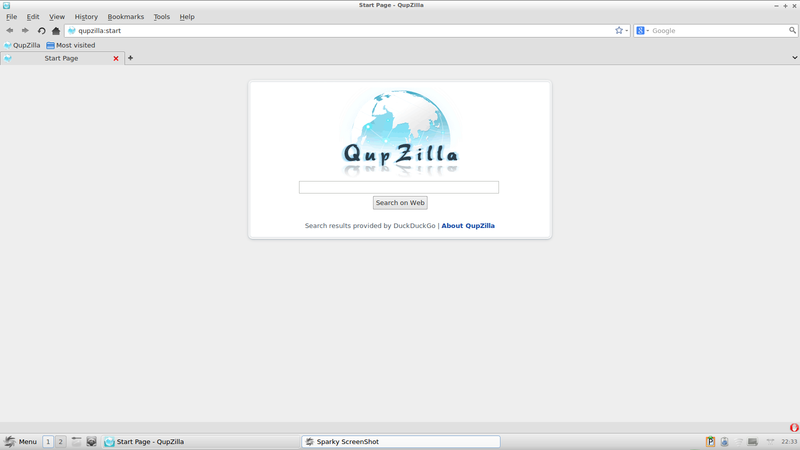 The default browser in SparkyLinux is one I had never heard of before called “QupZilla”. Whilst it is largely functional I had a few issues on certain pages. For example trying to load an image into blogger causes the browser to crash and attempting to choose options on Flash based sites requires the use of the tab key as the mouse click doesn’t work. SparkyLinux comes with a full set of applications for when you are online including the “Claws” mail client. “Claws” is alright as a mail client but not as fully featured as Thunderbird. You also have to know how to set up an IMAP or POP3 account manually as there isn’t an automatic connection as with other applications. 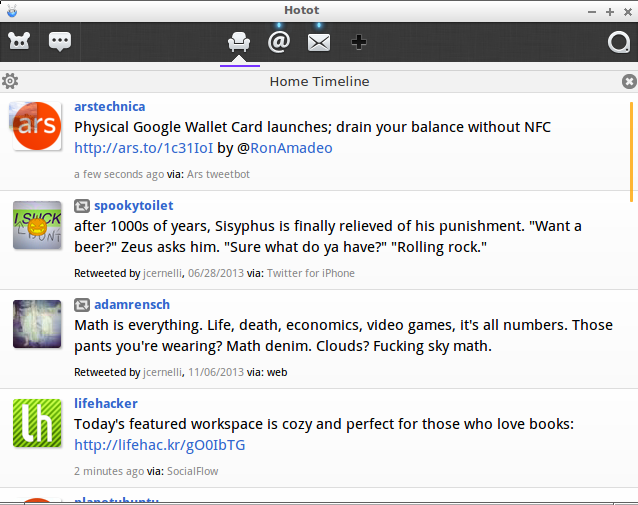 There are other online applications available and credit has to go to SparkyLinux for including Hotot which is one of the more useable Twitter clients available. 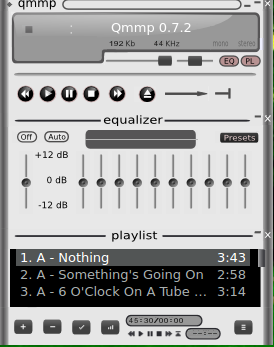 The audio player in SparkyLinux is qmmp. 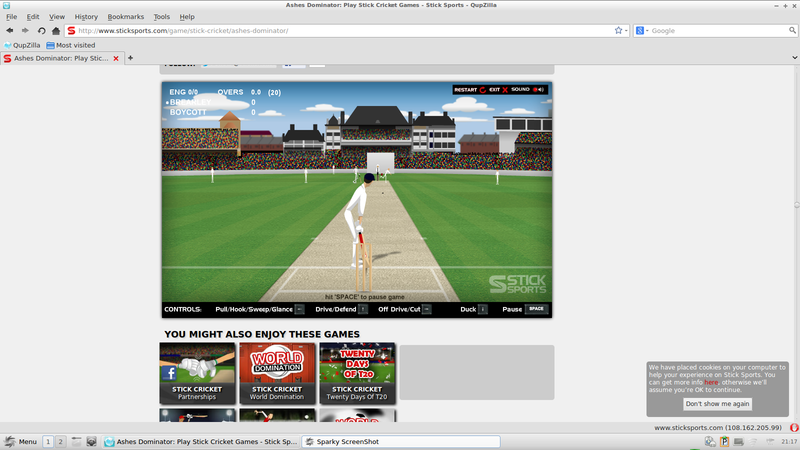 As with other applications included with SparkyLinux whilst the player is functional it isn’t the most attractive nor the most intuitive piece of software. MP3s do work without hassle. Flash also works without a hitch for both browsing sites containing Flash elements and Flash gaming. As mentioned earlier though to navigate the Flash menus I had to use the tab key as the mouse would not work. SparkyLinux comes with a whole host of applications so I won’t name them all. LibreOffice is installed meaning you have a word processor, spreadsheet, presentation tool and database application. GIMP is available for editing images. There are various video editors and disc burning tools. To fix the error you have to install cURL which can be done using the Synaptic Package manager. Synaptic is a good application for finding and installing software. Either browse the categories down the left hand side or use the search box to look for relevant programs to suit your needs. 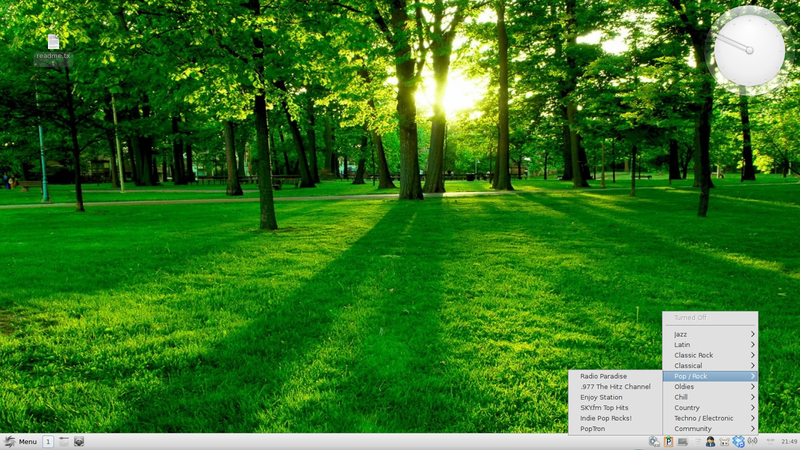 PlayOnLinux provides a simple way to install Windows applications. Simply click “Install a program” and a list of possible applications and games will appear. You will need either a user account for the relevant download site or the installation CD/DVD to install the software. 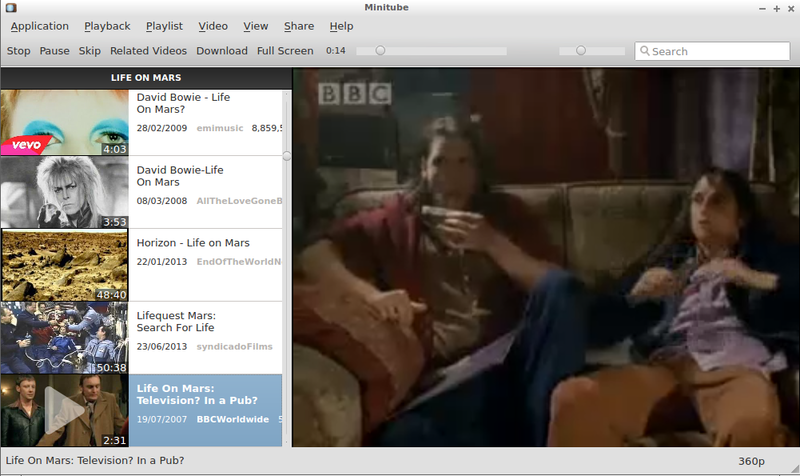 For playing music there is QMMP as mentioned previously and there is also the VLC player for watching videos. Other multimedia style apps include Minitube which lets you watch Youtube videos in a desktop application and Radiotray which lets you select from and listen to a range of online radio stations. Dropbox is also available which means you can store files in the cloud. Now I’m not going to sing the virtues of the cloud but consider what would happen if you had a fire or your house was burgled. Wouldn’t it be good to get those family photos and videos back? A rather strange pick on the menu was Teamviewer which lets you take control of another computer (and vice versa). Teamviewer is a Windows application and so when you run it within SparkyLinux it uses WINE. SparkyLinux is currently riding quite high in the Distrowatch rankings. There are plenties of plus points for using SparkyLinux such as the good performance and a good choice of software (PlayOnLinux, Dropbox, Hotot). I did find a few errors whilst using SparkyLinux. Clicking on open folder from the dropbox icon on the panel for some reason opened qmmp which is the audio player, Qupzilla crashed out a few times and PlayOnLinux required cURL to be installed prior to using it. The menu system also contains a spurious Debian category and I think this could be removed. Have you read these reviews? "One thing I did like was the fact that SparkyLinux forced you to enter a different password for the root user and the standard user." – that's the way it should be done properly. Question: Which version is the "lightest"; QT5, LXDE, E17, or Mate? This is indeed hard to know even if one has benchmarks to compare. Just for illustrate what I mean, I recently replaced KDE with Xfce on a slow CPU netbook, only to hear a complaint about how wi-fi camera videos (flash?) got more pixellated… wireless interference? maybe, but I just recalled having seen the cpupower ondemand governor working at the lowest notch. Then I thought, what if KDE — being heavier — makes the CPU clock beat faster — and that somehow affects video decompression? Strange, uh, a lighter desktop making things go slower (though arguably with much less power consumption). A second example is another netbook, now used as a server. 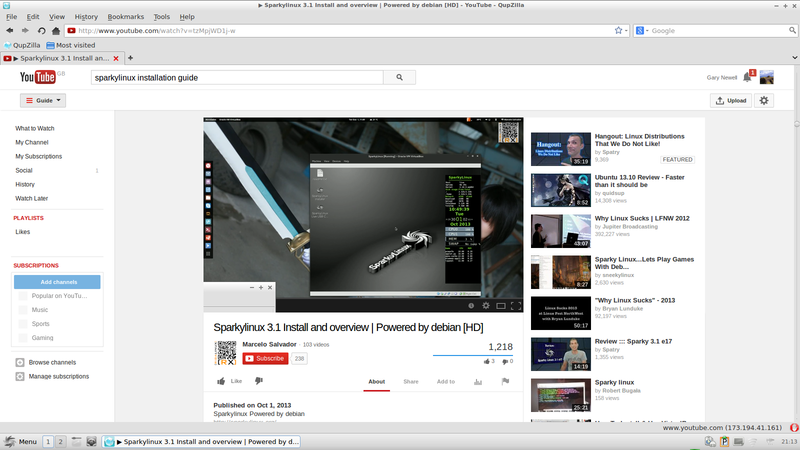 Even though it is not intended as desktop, I decided it would be nice to have at least the familiarity of Xfce. Since it is a netbook, I though about using crude fonts without antialiasing, just to save CPU cycles and make the server go faster. Then I realized it probably doesn't matter, because the little server will go day and night without anyone logged in. Characters won't be put on screen, so probably antialias won't affect much the system performance. All this is because despite having a DE, the machine is not used as a desktop. Life presents us situations which demand for similar hard decisions. One has to be careful not to pay attention to a single factor ("lightweightness") but also to the entirety of the user's experience. BTW, the first netbook had a feeble CPU and 4 Gigabytes of memory. Clearly lightweight for it was about which DE used less CPU — memory use was never an issue! Razor-Qt is going to merge with LXDE Qt. I don't know when it is going to happen, but I like Razor-Qt. Straight Razor-Qt does not load any apps by default, which is very handy, so you don't need to have Qupzilla etc. Never heard of RadioTray, but very cool that it sits in the taskbar. Thanks for mentioning it. In feedburner, the most recent post is "Our Favourite Linux Cheat Sheets" from September!!! Currently I run Sparky 3.1 in my netbook Lenovo s10, it works fantastic. Previously I found only Antix worked in my netbook. I choosed Sparky because it brings latest packages(almost latest), and the Desktop env MATE is just enough for me. I use this distro, and It's damn great!
" Teamviewer is a Windows application and so when you run it within SparkyLinux it uses WINE "
No, TeamViewer has a Linux-client, and even a .deb package. Teamviewer appears to be running under Wine like you say Gary. I do not believe it to be a true native Linux app.